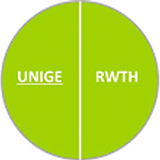 The work package 1 “Coordination and Management” is led by UNIGE, Professor Gabriele Thumann, Department of Ophthalmology and assisted in day-to-day project management by the “EU Project Management Office” RWTH (Fig.1). The objective of this work package is to build and maintain an effective and efficient project management, encompassing financial, administrative, contractual, and ethical components during the entire project period. Decision-making procedures are clearly identified and the management team will supervise and monitor the implementation and project progress consistent with the scheduled work plan and its tasks, deliverables and milestones. This is to assure high quality documentation of project results in accordance with the reporting periods. For all partners the implemented management structure serves as the guiding framework during the project duration. 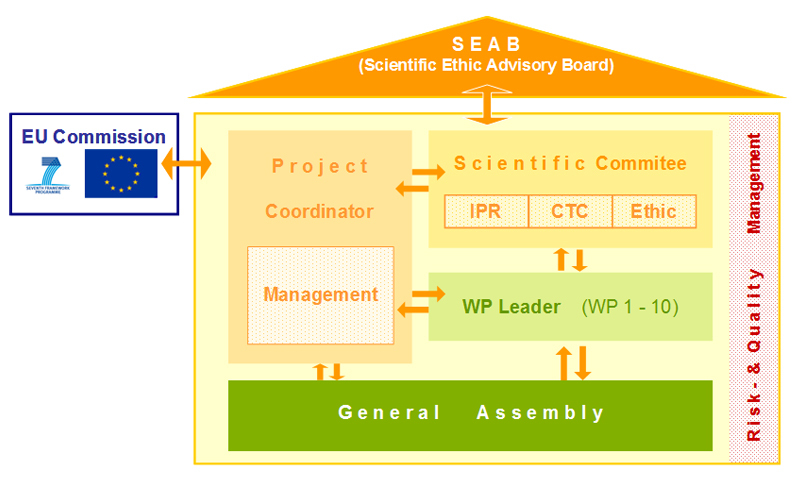 UNIGE, the coordinator, is supported by the scientific committee which consists of all division leaders and oversees the scientific research and collaborative work of the project. In addition managers for Intellectual Property Rights (IPR), Clinical Trial (CTC) and Ethics are appointed. The scientific work is promoted by the advice and support of the Scientific and Ethics Advisory Board (SEAB) (Fig. 2).